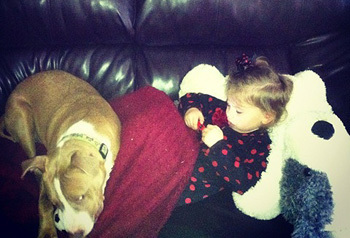 Some say pit bulls can be “vicious” around children. 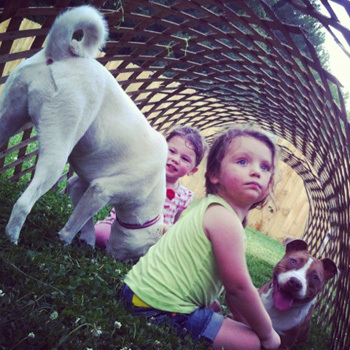 However, the only thing our pit bull Cleatus did to the children in my life, my nieces and nephews, is steal their hearts. About a year and a half into our marriage, my husband’s birthday was right around the corner. He has always wanted a pit bull, and I have always been afraid of them. After much thought, I finally decided it wasn’t fair to give the breed a personal shot. I adopted a little blue-eyed baby pit bull named Cleatus for my husband’s birthday. I brought him home, and the whole family seemed unsure. It did not take long for them to warm up to him – he was so friendly! Soon he became affectionately known as the “grand-puppy” by my in-laws, and people started asking where he was if we left him at home. My two soon-to-be 3-year-old nieces and newborn nephew are a huge part of our lives. Ever since we got Cleatus we’ve slowly lost their hearts to him. When we come over it has immediately become “where’s cwwweeaaatusssss,” and none of them seem to care if we are there or not. At first, we were hesitant to have him with the kids. After all, he’s very strong and much heavier than they are. It did not take long for Cleatus to change our minds. He is so careful around them – it’s as if he understands they are fragile. He will run circles outside around the pool, but when he comes up to them he will lay down and crawl to give them kisses. My niece can even take his favorite peanut butter-filled Kong right out of his mouth without repercussion. Now it’s turned into a game, when my niece wants Cleatus to chase her she leans down, steals his Kong, yells “come on cwwweeatttuss!! !” knowing he will follow her wherever she goes until he gets his Kong back. He even goes to the park with them. If they go up the slide, he goes with them. If they slide down the slide, he slides down too. If they get in the pool to go swimming, he throws a fit until we put him in the pool too. He is right by their side constantly. I never thought I would get over my fear of pit bulls. 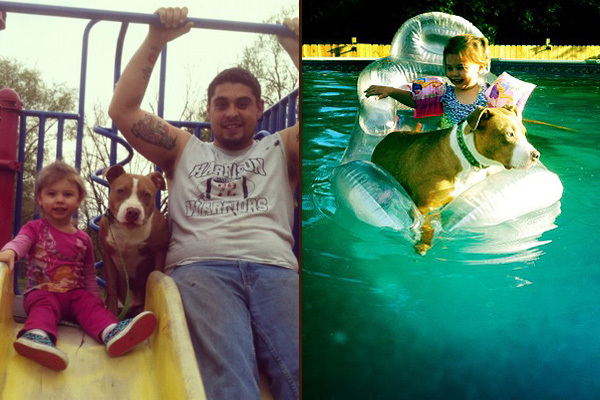 Not only has Cleatus taught me pit bulls are not scary, but he has also given my nieces and nephews a best friend. He was supposed to be a present for my husband, but he has done more good for me and the family kids than I ever dared to imagine. theprettychic haha, cute right? Cleatus is wonderful! KaleighMaeA2488 My two always are looking for food to steal. Sasha subtle with hers however, Krush is open with his intentions. KaleighMaeA2488 thanks for sharing Cleatus with everyone! He deserves his fame and the hash brown! Fantastic, awesome, beautiful story!! Thank you for be open minded and forward thinking…by opening your heart and home to pitbull type dogs is a win/win for everyone! These wonderful stories always make me cry!! Thank you for having an open mind!! ReneeMKeller the stories make us cry too, they are all so touching.